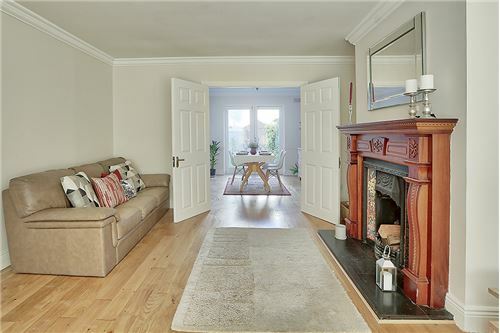 Award winning Auctioneering Team since 2003, Team Lorraine Mulligan of RE/MAX Results Celbridge & Lucan welcomes you to this wonderful 3 bedroomed family situated in a quiet cul de sac located in the heart of Luttrellstown. This home comes to the market in superb condition having been lovingly cared for by its current owners. 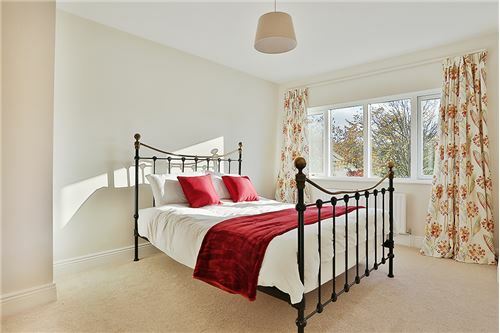 It has a newly fitted kitchen and westerly garden orientation to the rear that allows the afternoon and evening sun stream into this wonderful home. Its immaculately presented interior is in walk-in condition and is sure to impress any buyer. This home benefits from a tranquil setting overlooking a large green area, giving the discerning buyer space, privacy and peace of mind while children are at play. 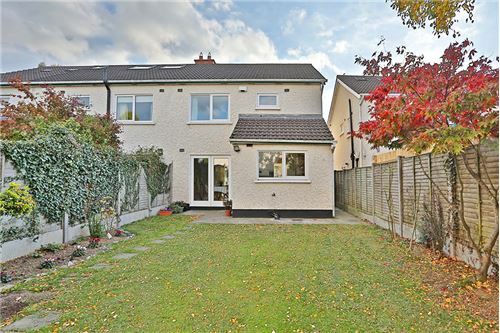 This home is located in an excellent position, only a few minutes’ walk to local shops, restaurants, St Patricks National school, Castleknock Community College and a range of local amenities. It is also within minutes’ walk of Coolmine Train Station and various Dublin Bus routes. There is also easy access to Castleknock, Blanchardstown Shopping Centre, M50, M3, Phoenix Park and City Centre. 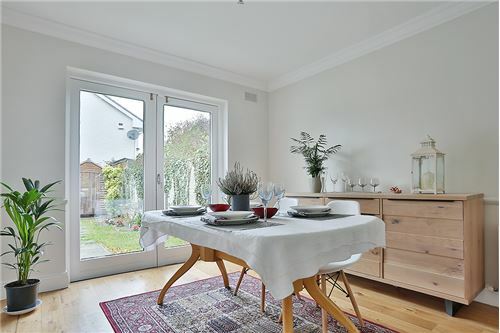 The accommodation briefly comprises of an Entrance Hallway, a bright and airy Kitchen, spacious Living Room and an interconnecting Dining Room that overlooks the back garden. 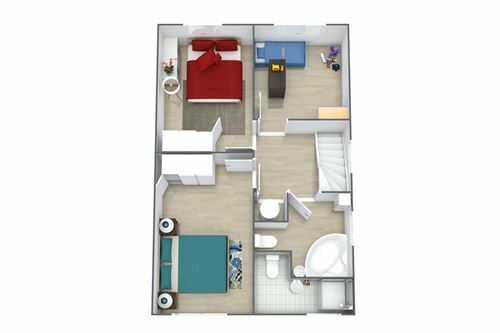 Upstairs there are 3 good sized bedrooms, master ensuite and main bathroom. 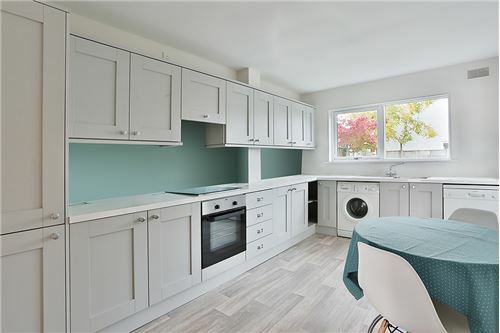 Grey fitted kitchen units, stainless steel sink, area fully plumbed, washing machine, dishwasher, new oven, new hob, light fitting, door leading to garden area. Feature fireplace with a wrought iron inset and polished hearth, wooden floor, coving, light fitting, curtains, t.v. point, double doors to dining room. Coving, light fitting, wooden floors, French double doors leading to garden area. Coving, light fitting, downstairs storage, wooden floor, phone point. Light fitting, recessed lights, hot press with immersion and shelving, carpet, attic access, attic partially floored. Fitted wardrobes, curtains, light fitting, carpet flooring. Light fitting, shaving light and socket, wall tiling, floor tiling, W.C., W.H.B., electric “T90 xr” shower. Fitted wardrobes, vanity unit, curtains, light fitting, carpet flooring. Light fitting, curtains, carpet flooring. 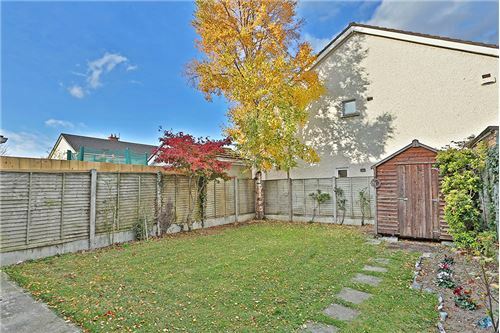 FOR SALE BY PRIVATE TREATY 9 Luttrellstown Rise, Castleknock, Dublin 15 (Floor Area c. 104 sq metres / 1119 sq ft) Award winning Auctioneering Team since 2003, Team Lorraine Mulligan of RE/MAX Results Celbridge & Lucan welcomes you to this wonderful 3 bedroomed family situated in a quiet cul de sac located in the heart of Luttrellstown. 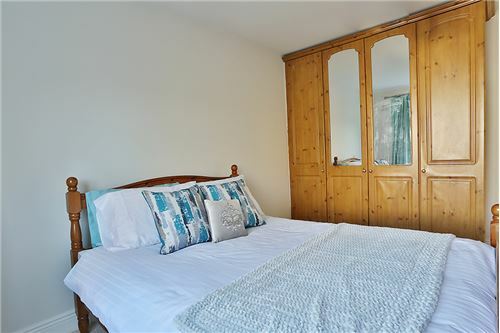 This home comes to the market in superb condition having been lovingly cared for by its current owners. It has a newly fitted kitchen and westerly garden orientation to the rear that allows the afternoon and evening sun stream into this wonderful home. 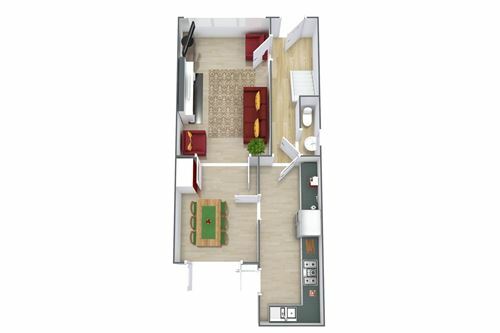 Its immaculately presented interior is in walk-in condition and is sure to impress any buyer. This home benefits from a tranquil setting overlooking a large green area, giving the discerning buyer space, privacy and peace of mind while children are at play. 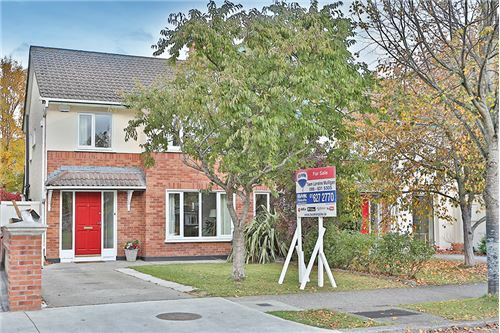 This home is located in an excellent position, only a few minutes’ walk to local shops, restaurants, St Patricks National school, Castleknock Community College and a range of local amenities. It is also within minutes’ walk of Coolmine Train Station and various Dublin Bus routes. There is also easy access to Castleknock, Blanchardstown Shopping Centre, M50, M3, Phoenix Park and City Centre. 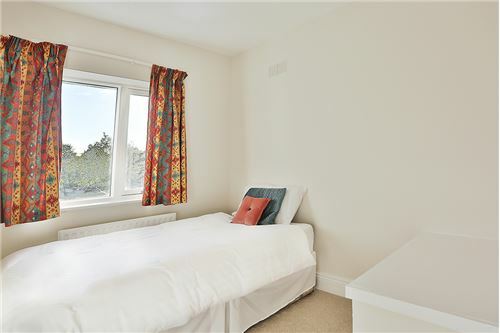 The accommodation briefly comprises of an Entrance Hallway, a bright and airy Kitchen, spacious Living Room and an interconnecting Dining Room that overlooks the back garden. Upstairs there are 3 good sized bedrooms, master ensuite and main bathroom. 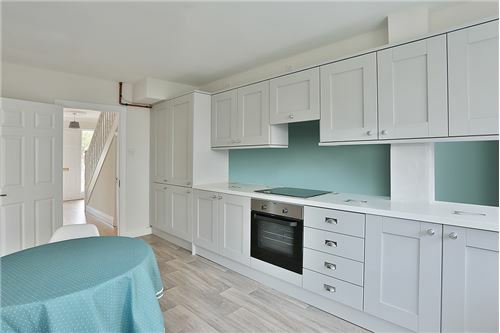 ACCOMMODATION KITCHEN: 5.2m x 2.8m Grey fitted kitchen units, stainless steel sink, area fully plumbed, washing machine, dishwasher, new oven, new hob, light fitting, door leading to garden area. 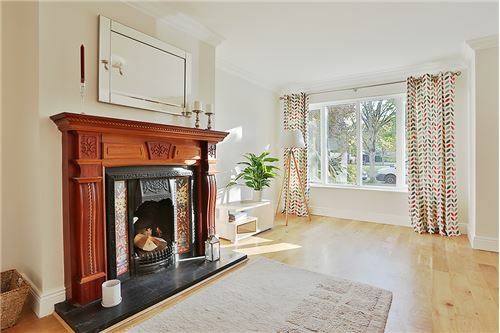 SITTING ROOM: 5m x 4m Feature fireplace with a wrought iron inset and polished hearth, wooden floor, coving, light fitting, curtains, t.v. point, double doors to dining room. 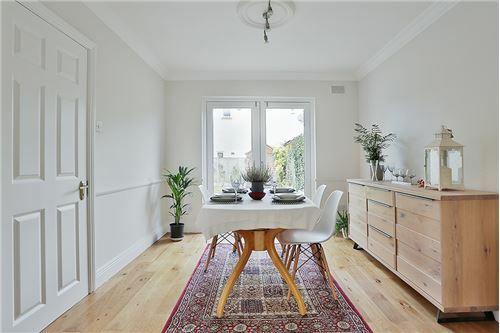 DINING ROOM: 3.4m x 3m Coving, light fitting, wooden floors, French double doors leading to garden area. 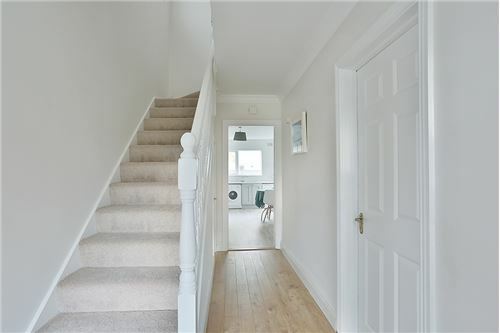 HALL WAY: Coving, light fitting, downstairs storage, wooden floor, phone point. LANDING: Light fitting, recessed lights, hot press with immersion and shelving, carpet, attic access, attic partially floored. 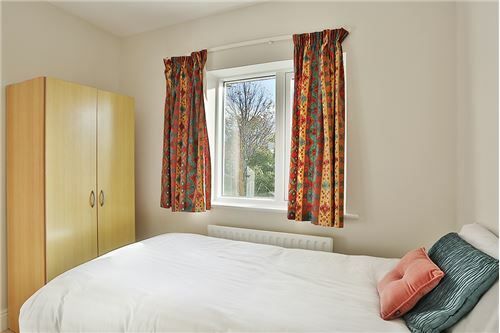 BEDROOM 1: 3m x 4m Fitted wardrobes, curtains, light fitting, carpet flooring. ENSUITE: Light fitting, shaving light and socket, wall tiling, floor tiling, W.C., W.H.B., electric “T90 xr” shower. 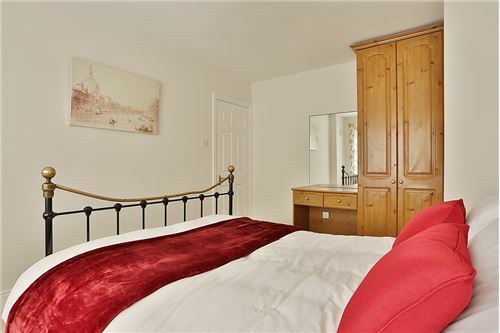 BEDROOM 2: 4.3m x 3.1m Fitted wardrobes, vanity unit, curtains, light fitting, carpet flooring. 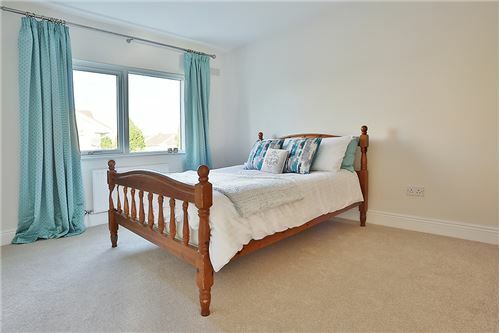 BEDROOM 3: 2.7m x 2.5m Light fitting, curtains, carpet flooring. 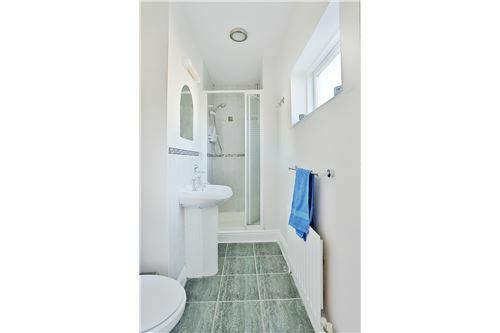 BATHROOM: 2m x 1.7m Light fitting, shaving light and socket, wall tiling, floor tiling, W.C., W.H.B., shower, bath. FEATURES INTERNAL: • Excellent 3 bed semi-detached house, recently upgraded • All curtains & newly fitted carpets included in the sale • All light fittings included in sale • Property fully alarmed FEATURES EXTERNAL: • Property located in a quiet cul de sac • Overlooking green area to the front of the house • Sunny west-facing rear garden • Landscaped mature gardens with raised flower beds • Property not overlooked • Double glazed windows • Close proximity to schools, bus routes and Coolmine train station SQUARE FOOTAGE: 104 sq mtrs/1119 sq ft HOW OLD IS THE PROPERTY: 1998 BACK GARDEN ORIENTATION: West BER RATING: C2 BER NUMBER: 108012212 SERVICES: Mains water, mains sewerage. HEATING SYSTEM: Natural gas.